I got to cross off a "Bucket List" item recently. It reads: "Get food from one of those trendy food trucks"
Living near Los Angeles, these trucks are VERY popular. 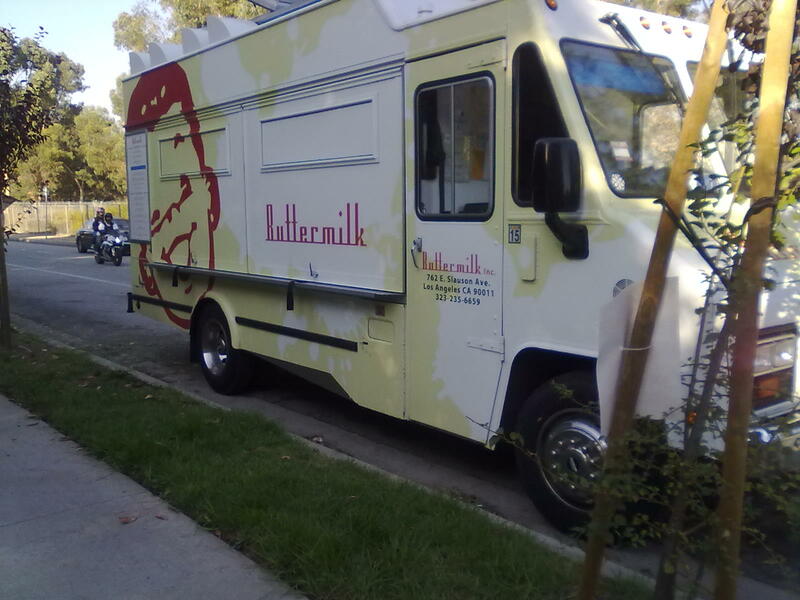 I've had food from one of those old school "roach coach" taco trucks, but in recent years, food trucks serving everything from cupcakes to pancakes have been rolling around the streets in Southern California. Even after all this time (a couple of years?) since they became popular, I have not engaged in trendy-food-truck-eatage. I've had a couple close calls, but no dice. 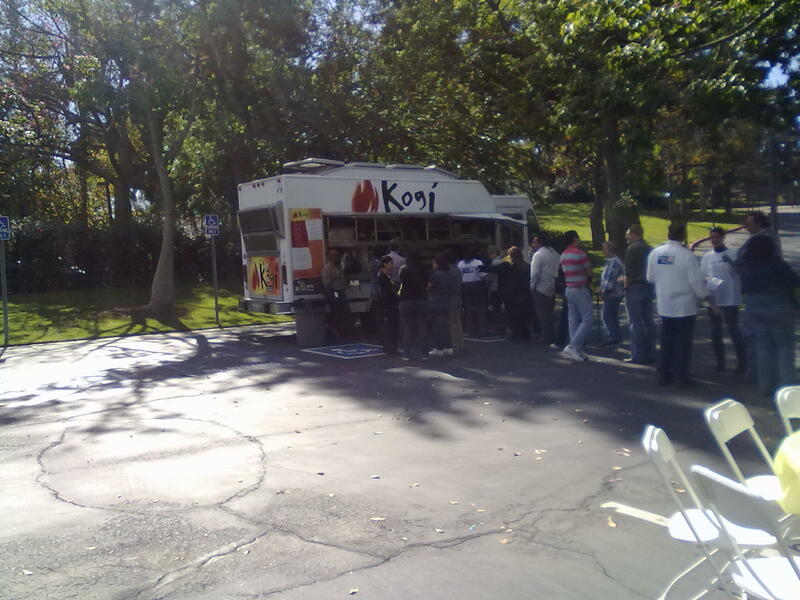 Close call #1: Kogi came to my work. Yes, it came STRAIGHT to me, but the line was off-putting, and I needed to get back to work! Close call #2: I was driving home from work one day and saw this one called Buttermilk on the side of the road. I pulled over, hoping for some of their red velvet pancakes. No such luck... they weren't open!! I had to take the dog to the vet that afternoon and wasn't sure if I'd be able to wait through those food truck lines AND get to the appointment on time, so even though he'd never been out before, we took him along. I really love this picture below. My dog brother (since he's my dad's dog, I am by no means his "mama" like people out there were calling me) is seemingly asking, "What's going on, big sis?" For it being the first time out for this 4.5-month old puppy, it didn't go that badly. He got a lot of attention! Here is where I lost my trendy-food-truck-virginity -- I hadn't eaten lunch and was pretty hungry. Given that this was one of the shorter lines and featured some of my favorite junk foods, we lined up here at Fresh Fries. Order #1: Curry mayo, mango chutney, and ketchup natural-cut fries. I think I had a third of this because I had my hands full with a rambunctious puppy and wind blowing the food cold pretty quick (ugh). Also, I managed to spill a huge glob of ketchup on my jeans (luckily not the curry, though!!). This interesting combo was very tasty, when hot. This Willoughby Road truck had a small line, but it was deceiving, as I had to wait in the wind with puppy in tow for more than half an hour at the tables with "The Ukrainian" placed his order. He got this fried catfish sandwich with collard greens and some kind of semi-spicy, heavenly sauce. The collard greens were cooked with bacon, so when I sampled, I was careful to stay away from it (I never liked bacon, ugh!). After the vet appointment, we dropped the little guy back at home to his real papa. Since I only took a few bites of food in total at the festival, I got hungry pretty quick and picked up this little number at the mall. That was much fancier food than I would expect from a truck! I know what you mean about trying to eat your food while it's hot and wrangling a puppy. Whenever I try to eat while the baby is awake, I try to eat something cold so it doesn't get gross! I kind of regret not going to the food truck rally but it's so hard to find healthy things to eat from a food truck. That catfish sandwich looks really good though. Reminds me of a crispy chicken sandwich. I haven't had one of those in a really long time. I use to love them. I still love them, I just try not to eat them now. Curry mayo and mango chutney from a food truck? Yep, definitely fits the trendy bill. We have some of these fancy ones creeping up in Philly amidst the old school trucks and carts. I haven't tried one yet, but I've definitely been tempted by a couple. Next time I'm by one of the universities, I'll definitely have to partake. I envy all your food-truck fare! I've never eaten from one, but I'd love to! You are fortunate to live in a climate that is conducive to having food trucks! :) I would love it if we had more of those around here. The food looks great! And that dog is very cute! I just wanted to stop by and say that i love the name of your blog! So funny! And those sweet tater fries with humus looks amazing! My husband makes me watch all the cooking shows. Once, they had a series on food truck and I have wanted to eat at a good one ever since. The pics gave me some inspiration for mango chutney! mmmm. Man - food trucks have come a LOOOONG way since my college daze. We didn't ever have good-looking fare like that out of the greasy trucks parked all over West Philly.